History and social narratives can be a weapon for justice. We all know the famed African proverb, “Until Lions write their own history, the tale of the hunt will always glorify the hunter”. Something akin to this important reclamation struggle, for ownership of history and narratives, keeps a meandering “progress” in Hollywood Florida. As many are aware, the city of Hollywood has public tributes, in the form of street names, to figures that took up arms to perpetuate slavery and break the country apart during the Civil War. The streets are Forrest, Hood and Lee. Despite how ridiculous it is that in 2017 such issue have not been resolved, and how simple it would be to get it done, the city continues to find itself wedged in argumentations which do not even acknowledge the fact that the city’s own rules state that street names cannot be controversial, little else, be in honor of such figures like Nathan Forrest, the first Grand Wizard of the KKK. What we should all know is that there is a dire need to RECLAIM the history behind these street names. It is very clear the INTENTION behind the changes. There have always been streets originally named after presidents and such figures, but the streets discussed here were renamed latter on, and they played NO role in the founding of the city. This campaign is about reclaiming the original history of the city. 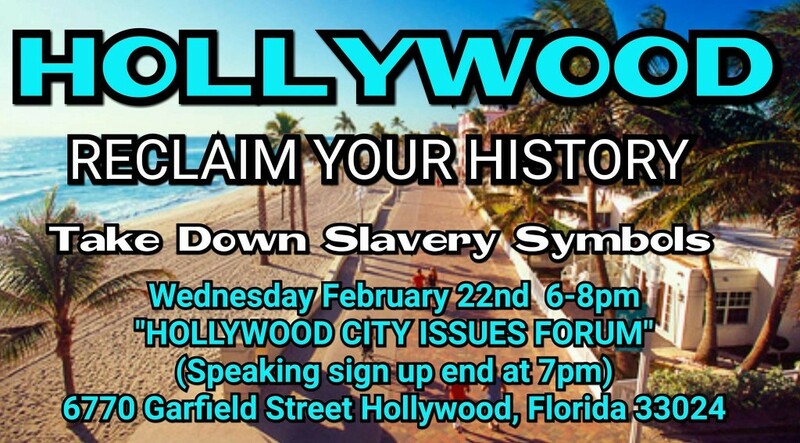 We should all know that in Hollywood, since its founding on 1925 by Joseph Young, streets had original names, celebrating the history of the country, and in some areas, celebrating cities with high populations of African Americans (Chicago St, Savannah St, Louisville St etc). Then these names celebrating American cities were CHANGED to honor figures like Forrest. It went from names honoring US cities, to names, again, honoring figures that took up arms to break apart the country and keep slavery forever during the civil war, so that we now have Forrest, Hood and Lee Streets. All this comes from investigations by the Hollywood Historical Society and community efforts to raise awareness going back to 2002, where printed articles can be found discussing these very issues. All this happened during the 1930s and 40s, names were actually changed from the originals. TODAY, we’re RECLAIMING the original intent of names by Hollywood’s founder Joseph Young, his legacy and ESPECIALLY the legacy of historical residents, like those of Liberia, must be respected and reclaimed today. Let’s STAND UP for history! !